Happy Monday Lovelies….I hope your weekend was AMAZING! Today, it’s all about styling one of my favorite looks…”Animal Print” and “Snakeskin Print”! I love animal prints…the print that works in each season…now how fab is that. Oh my gosh y’all, I have to share with you that I didn’t realize that I have three animal print coats…thanks to Banana Republic and they will never go out of style…I love it! 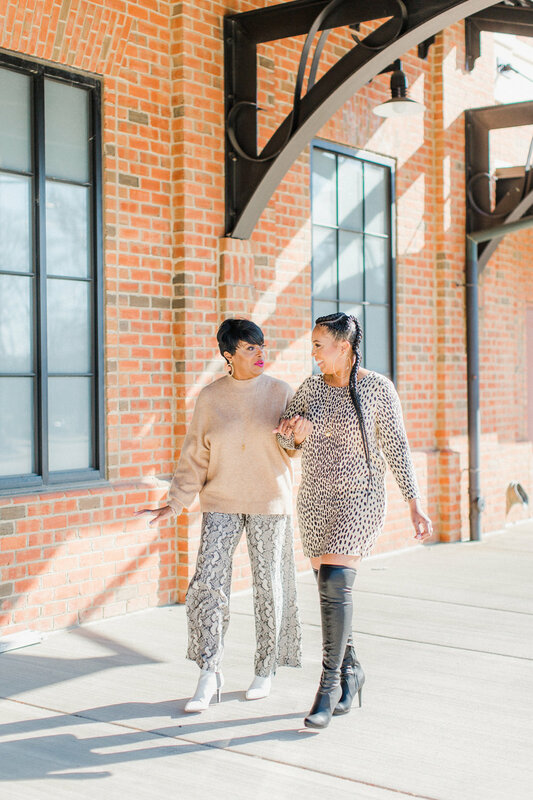 So, a few weeks ago, my girl Shi…check her out here as well, we got together and put on our favorite animal print looks and had a great time with Ali capturing all the moments and Erika doing her thing on the glam! Shi is wearing a leopard print dress with her over the knee black boots. How cute is this dress from J.Crew…it’s actually about six seasons old…..yes, it’s still in style and I totally shopped by closet for this segment as Shi hadn’t planned to shoot this look with me, but as you can see, we made it happen. Shi’s braids were so perfect with this look…so chic and a little edgy…check out the stylist Billie, here! Erika kept the makeup natural and Shi added her big hoop earrings…she totally ROCKS this look! I’ve been looking for the perfect snakeskin print pants and I finally found them at H&M and they are wide leg….love them! This is actually my first time purchasing something for myself at H&M…I’ve shopped there for the grand kids, but never for myself….so, I got these pants and I choose a camel color sweater to go with….and I’m wearing my white booties to finish off the look….I’m wearing a bold lipstick and I could of went with a natural lipstick as well…I kept my gold accessories to a minimum with gold hoop earrings, necklace and bracelet. Go with a bold or neutral lipstick. Have fun with this and step of your comfort zone. Treat animal prints as a neutral color and pair with black or a pop of color…I love pairing the pattern with a neutral for the monochromatic look and feel. Thanks so much to my girl Ali of Alisandra Photography for capturing all the fun and to my girl Erika of Erika Nixon for our glam!